In the past few days we've seen another .brand website launched from one of the tech industry's biggest players: Google. Google launches a new corporate blog at www.blog.googleGoogle has launched a new corporate blog at www.blog.google. 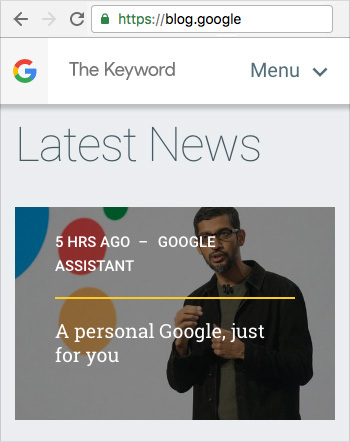 Entitled The Keyword, Google describes the site as a "new central source for news and stories about Google." It brings together "all the stuff we had across 19 blogs, in one place… If you're looking for something from Google from now on, chances are it's here." The launch of The Keyword has already gained media attention from tech and industry news platforms, with Mashable describing the new address as "the admittedly quite cool web domain 'blog.google'". This isn't the first .google domain to be released. In April Google switched its Registrar website to www.domains.google and last year, its April Fools' prank involved a mirrored version of the search engine on www.com.google. A search for "Google Blog" still returns the legacy address googleblog.blogspot.com as the first result, however this redirects to the new .google address. We noticed that the domain chosen wasn't 'keyword.google' or 'thekeyword.google' to match the new title of the blog. While this may be coming further down the track, using the generic term 'blog' is perhaps a more clever strategy for ensuring the blog can be easily found without relying on visitors remembering the exact brand name. Google's corporate and product blogs host thousands of articles that are frequented by countless tech evangelists. Now, every one of these visitors will be exposed to the .google domain and will slowly become accustomed to using the new extension when they want to visit the official Google location. Local Time: Tuesday, April 23, 2019 09:32 PM PDT – Page Load: 0.3280 Sec.